2015 Ride of Silence May 23. Our annual Marin County Ride of Silence took seven of us once again around the Tiburon Peninsula on a gorgeous Saturday. We chose to ride on Saturday rather than the regular RoS Wednesday in hopes of increasing the number of riders and also because past participants have generally been relatively inexperienced and uncomfortable with riding in the evening when there’s little light at the end of the ride. Sylvia Bingham’s parents organized the ride and were pleased to have one of Sylvia’s friends and her dad join the ride. 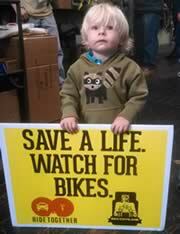 We once again read the names of all those we know of who have been killed biking on Marin’s streets. 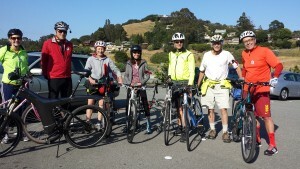 The ride was publicized in the newsletter of the Marin County Bicycle Coalition. We still hope to get MCBC to sponsor future RoS rides, as this would ensure greater participation. 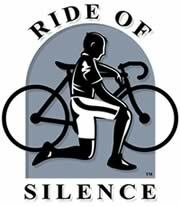 What is the Ride of Silence? 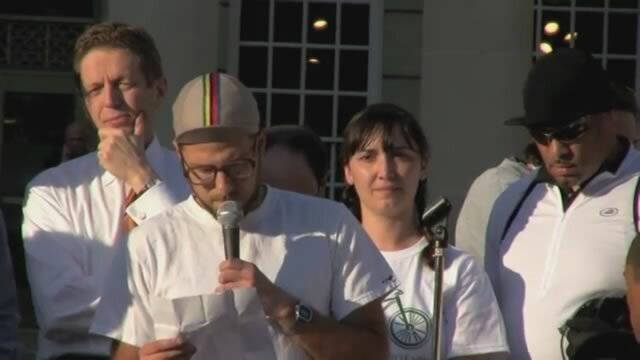 A slow and somber ride to honor the lives of bicyclists who have been killed or injured while cycling and to raise the awareness of motorists, police, city officials, and the general public of the need to share the road safely with cyclists who have a legal right to use the public roadways. Our Marin ride will NOT be on May 20, the official international date of the ride, but on the following Saturday. This because we have been unable to interest more than a handful of the Marin cycling community in coming to a 7 pm mid-week ride. Quiche, dessert pies and beverages will be served – This is not a potluck but feel free to bring a home-made dish if you love to cook. If you’re not able to come, please visit the SBF website and consider a donation so SBF can continue supporting organizations working to make biking safer or whose work Sylvia would love. 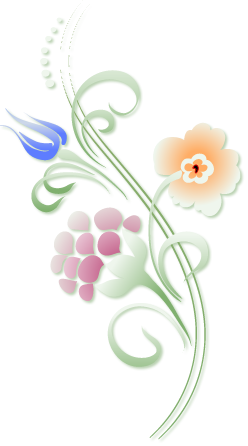 To see grants awarded by SBF, click here. 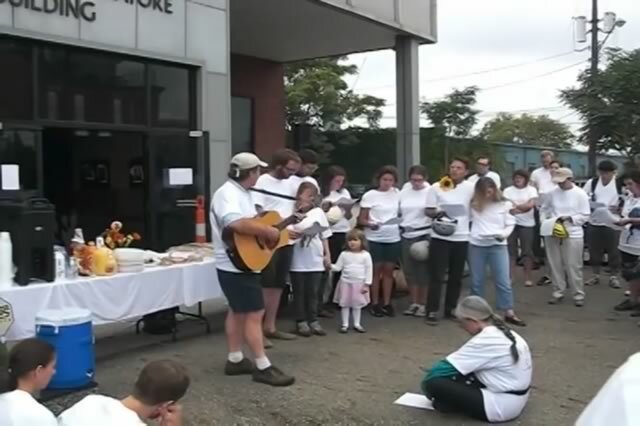 A wonderful memorial ride took place in Cleveland on 9/22/2013, a week after the 4th anniversary of Sylvia’s death. Around 40 people participated. Click here to view event photos. The ride left from the Sculpture Center, whose exhibit on Mourning included the bike Sylvia was riding when she was killed. In conjunction with the Cleveland ride, Jim Sheehan of the Ohio City Bicycle Co-Op where Sylvia bought her bike, wrote this commentary about Sylvia and the origin of the “I Ride for ____” T-shirts. 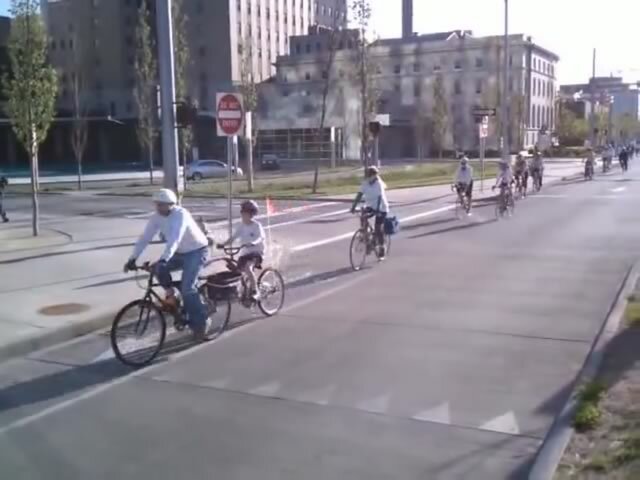 This Sunday, September 22nd, at 5pm in Cleveland, there will be a silent memorial bicycle ride in mourning and memory of Sylvia’s Bingham’s death as the result of a collision with a truck while riding her bicycle to work on the morning of Tuesday, Sept. 15 2009. This will be the fifth ride held in her honor. The ride will begin at The Sculpture Center, where, as part of a new exhibit called Made in Mourning, a ghost bike made in Sylvia’s honor will be displayed outside the gallery on Euclid Avenue from the exhibit’s opening on the evening of Thursday, September 19th until the the ride on Sunday, when it will be re-installed at the site of her death, at East 21st St and Prospect Avenue. Sylvia’s ghost bike outside the gallery will be juxtaposed with the bike she was riding when she was killed, displayed inside as part of the exhibit, with spoke cards on which gallery patrons and ride participants will be invited to complete the phrase, “I ride for _______.” These spoke cards will then be affixed to Sylvia’s ghost bike when it is left at 21st and Prospect, near a sidewalk plaque her parents commissioned and had installed there in 2012. These cards will echo the slogan that her friends printed on t-shirts for the first ride in her honor shortly after her death — “I ride for Sylvia” — inspired by the fact that, during her brief life in Cleveland, Sylvia used to joke that she needed an erasable T-shirt that said, “I RIDE FOR _______ .” so she could just fill in the blank with a different reason every day, because her co-workers would invariably ask her, “Why do you always ride your bike to work?” and she had so many answers to choose from. In honor of Sylvia’s life, The Sculpture Center is sponsoring a free Traffic Skills Seminar from 2-5pm on Sunday Sept. 22, immediately before the memorial ride. This brief discussion and short ride examining how bicycle crashes happen, and how to avoid them, is free and open to anyone over 16, but registration (here) is appreciated. The exhibit will be open at 1pm on Sunday, before the class, and before the 5pm memorial ride as well. The ride, which will be held in silence, will stop at East 21st St and Prospect Avenue for a period of reflection, after which participants may either return to The Sculpture Center with a group, or continue on with some of Sylvia’s friends to Edgewater Beach, one of her favorite places in Cleveland, and make their way home or back to the start on their own. Participants are encouraged to wear white shirts. Our condolences are extended to Sylvia’s family and friends, and our commitment to making cycling safer for all has been sadly strengthened by the tragedy of her death. Donations in her honor can be made to the Sylvia Bingham Fund, which promotes bicycle safety and environmental concerns.